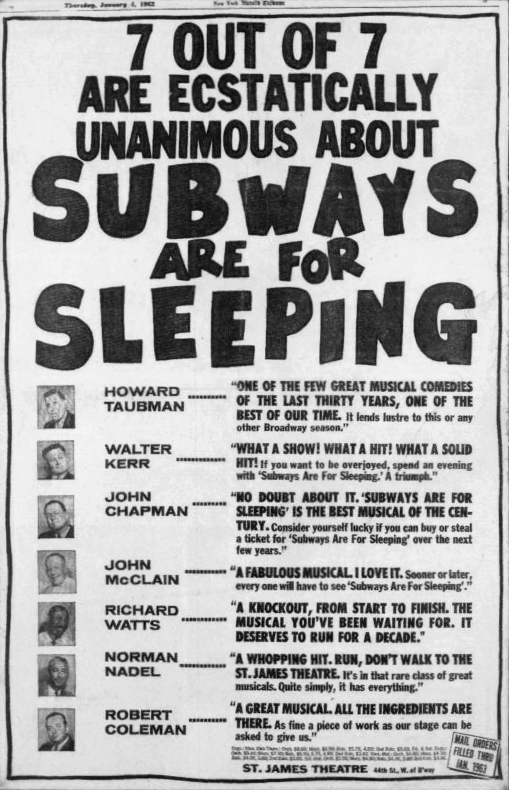 On 4 January 1962, an advertisement appeared in the New York Herald-Tribune for a Broadway play titled "Subways Are For Sleeping." The play hadn't been doing well at the box office. But judging by the ad, it appeared to be a critical success. The names of seven well-known theater critics appeared in the ad, and accompanying their names were the rave reviews they had given the play. For instance, Howard Taubman (of the NY Times) said the play was "one of the few great musical comedies of the last thirty years, one of the best of our time. It lends lustre to this or any other Broadway season." Richard Watts (of the NY Post) judged it, "A knockout, from start to finish. The musical you've been waiting for. It deserves to run for a decade." John McClain (of the New York American) said the play was "A fabulous musical. I love it. Sooner or later every one will have to see 'Subways Are For Sleeping.'" The ad would have appeared in all the leading New York City papers, but an editor at one paper noticed something puzzling about it before he gave the okay to publish it. Small pictures of the theatre critics accompanied their quotations. However, the picture of Richard Watts showed a black man, and the editor knew that Richard Watts, the theater critic, was white. He notified the other city papers that something was wrong with the ad, and so none of them ran it except for the Herald-Tribune, which had already gone to press. Upon closer inspection, it turned out that the picture of Richard Watts was indeed not a picture of the theater critic Richard Watts. Nor did any of the pictures display an image of a professional theater critic. The man responsible for the ad was David Merrick, the producer of "Subways Are For Sleeping." Faced with lukewarm reviews of the play, he had devised an elaborate stunt to bring it publicity. He found seven people in New York City who happened to have the same names as seven well-known theater critics. He then invited these seven people to a free performance of the play and afterwards wined and dined them until they agreed to let him use their names in the ad for the show. Therefore, the ad was entirely truthful. Richard Watts really did say that the play was "a knockout from start to finish." However, the theater critic Richard Watts had never said those words. Merrick later confessed that he had wanted to pull off this stunt for many years. However, he had long been deterred from doing so because he couldn't find a person with the same name as the famous critic Brooks Atkinson of the Times. When Atkinson retired in 1961, Merrick seized his opportunity. Although the misleading ad only appeared in one edition of one paper, it did generate some much-needed publicity for the play. "Subways Are For Sleeping" went on to run for 205 performances, and Phyllis Newman won a Tony Award for her performance in it. Although "Subways Are For Sleeping" was never a runaway hit, the rest of Merrick's career was far more illustrious. He produced over 80 shows, including Oliver!, Beckett, Hello, Dolly!, and 42nd Street. Merrick died on April 25, 2000 in London. Michael Portantiere. (April 26, 2000). Farewell to The Producers: Remembering Alex Cohen and David Merrick, deceased within three days of each other. Theatermania.com. David Merrick... My kinda guy!. talkinbroadway.com.